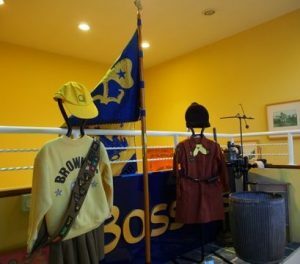 Congleton Museum is celebrating 100 years of the Brownie Guides, in style, with a fantastic new exhibition. Documenting the last hundred years of the Brownies, the exhibition reveals some of the little known history of the organisation. Lord Baden-Powell decided to create a junior section of the Girl Guides in 1914, for girls of 8 to 11 years old. First called ‘Rosebuds’, the girls had to pass a basic entrance test before they could take their promise. They had to be able to wash up the tea things, hem a duster, and plait their own hair. Originally in a uniform of dark blue, the Rosebuds were encouraged to contribute to the local community. The name change to ‘Brownies’ occurred in 1915 at the request of the girls. It was based on Mrs. Ewing’s story of little people who did good turns. With the motto of ‘Lend a Hand’ the Brownies set out to do just that. The brand new promise of 2013 shows how the principles of the Brownies have little changed from 1914, with an emphasis on doing their best, helping other people and keeping the Brownie Guide Law. The free-of-charge exhibition runs until 7th August, so be sure to pop in and take a look at the surprising history of the Brownie Guides.